You can now buy Twilight DuWop Lip Venom at Sephora stores and online for $16. A shimmering, crimson lip stain suspended in a venom-laced liquid lip conditioner. Twilight Venom should be shaken before use (to represent the blending of the human and vampire worlds) and can be applied repeatedly until desired intensity of color has been reached and lips are plumped and revitalized. 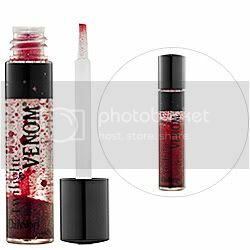 Its containing formula contains argan, avocado, and olive oils as well as vitamin E.
With a customizable ruby stain that captures the blood red lips sported by fashionable vampires, Twilight Venom can let you play the part! What’s next? Twilight jellybeans that sparkle like Edward Cullen? they keep going to far with products! Haha, Matt from Twilight Source has this video on YouTube where he’s iChatting with Laura and he tries this stuff. He said that it burns because of lip plumper and then when he tried to take it off, it literally stained his lips so they were like SUPER red. so do you think Steph authorizes this stuff? “What’s next? Twilight jellybeans that sparkle like Edward Cullen?” hahaha! so true. so true. Its going so overboard now. its not as fun as it ust to be. wonder where you can buy it in australia?????????? funny they’re making people buy this so they could be like “part of twilight” weirdd agree with most of you people….but this would be great for halloween thats it…not for everyday use….do they think people are that obssess? I love this stuff! But it does sting when you apply it…. i want it, but it stains ur lips and burns, but it would still b cool!! Log in | 53 queries. 1.060 seconds.